Neil Takemoto is the founder and CEO of Cooltown Beta Communities. His work over the last 17 years has been focused on crowdsourced placemaking, that is, sourcing crowds to create community-oriented places people love. Neil is committed toward building inspiring triple-bottom-line places to live, work, learn and play. 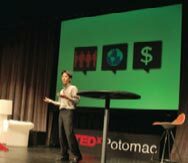 I collaborated with Neil Takemoto to design a custom keynote presentation about Crowdsourced Placemaking, presented at TEDx Potomac on May 2010.